If you have to smoke 12-pound turkey for instance, you have to spare at least 8 hours for the exercise. However, this might not be the case for a smaller-sized turkey. Wondering how this variation comes about? You are at the right place. 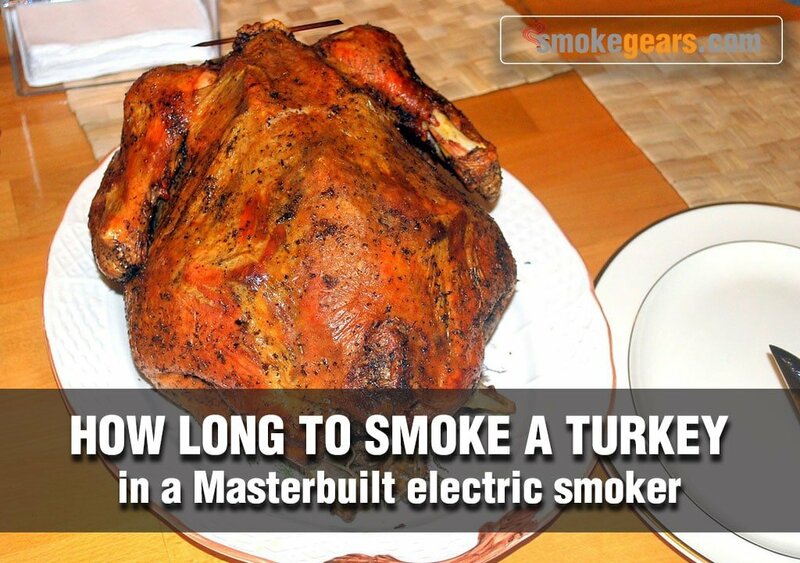 This complete guide on how long to smoke a turkey in a Masterbuilt electric smoker will solve your suspense. First, you have to master how to smoke a turkey in electric smoker. This way, you will automatically understand the length of time to spend smoking turkey in your Masterbuilt equipment. Depending on your needs, you will prepare any size of turkey, ranging between 8 and 20 pounds. If you are preparing it for a small family, 8 pounds can fit you. If it is f or commercial purposes like in the restaurant, you can go upto 20 pounds. Whether it is thawed or fresh, be sure to remove the giblets and neck. Then you can allow some time for draining to take place. You can now dry with recommended paper towels. Note that thawed turkey is only safe for smoking and consumption upon staying in the refrigerator for at most 2 days. For even smoking, we recommend complete thawing. You will need to have a meat thermometer to monitor the internal temperature of your turkey. Get it ready and brush some vegetable oil on the thigh, then insert the thermometer into the lower thigh. In so doing, avoid stuffing your turkey. Know about which grilling mistakes can destroy your party. Set your Masterbuilt electric smoker at 225 degrees Fahrenheit. Place any part of your turkey on one of the cooking racks. Close your smoker and let it smoke for around 10 hours. The smoking duration should coincide with the inner thigh temperature of 180 degrees Fahrenheit. Check the internal temperature of your turkey after 31/2 hours. At this time, it is expected that your turkey will have passed through a critical temperature range of 40 degrees Fahrenheit to 140 degrees Fahrenheit. If it smokes beyond 4 hours before passing this critical temperature range, you better use an oven to finish it up. Prior to carving your delicacy, cover and chill it for 20 minutes. You now have a full picture of how turkey smokes. At this point, it is easier to tell how long to smoke turkey in a Masterbuilt electric smoker. The basic hint here is that a whole turkey smoking at 240 degrees Fahrenheit takes 30 to 40 minutes per pound. If you are smoking a smaller-sized turkey say 8 pounds, you have to spare at least 4 hours for smoking. Turkey breast smokes at the same rate as a whole turkey with the same temperature setting of 240 degrees Fahrenheit. The breast of an average-sized turkey is approximately 6 pounds in weight. This implies that you will have to smoke it for 3 hours. Turkey legs require smoking temperature to be set at 225 degrees Fahrenheit. It is generally recommended that turkey legs should smoke for 4 hours. Turkey wings also require smoking temperature of 225 degrees Fahrenheit. They smoke for at most 2 hours. Some tips to smoke chicken (turkey) legs here. Generally, turkey is softer than meat and may take shorter to smoke as compared to the time indicated. The indicated duration for smoking of different parts of meat is just the average. Use of internal food meat thermometer is the ultimate guide to producing a completely smoked turkey. If your Masterbuilt smoker does not have an internal thermometer, you can alternatively use an external probe thermometer. Generally, turkey is fully smoked at 165 degrees Fahrenheit. No matter the method of smoking, exact appliance or the specific cut of the turkey, 165 degrees F.
Little Liquid Smoke can increase its smoky flavor. You can try Liquid Smoke to take smoky taste. The above guide offers sufficient tips on the ideal procedure of smoking a turkey in an electric smoker. There are high chances of over-brining your meat. Leaving it for too long also makes it salty. The best option here is to be timely with your smoking. Very easy to smoke a turkey, right? If you have a plan to grow your party menu, so try turkey (chicken) pizza and the spinach turkey chicken. Follow the above tips to heighten your turkey smoking experience. Possibilities of your successful smoking depend on your choice of electric smoker. For convenient turkey smoking, we recommend choosing Masterbuilt models. If you want to smoke like a pro, this guide is your ultimate gateway to success. Don't forget to read bbq cookbooks for better and perfect grilling.